Our new art posters bring back the Riders and make Eragon/Arya finally happen! We’re trying something new: a very limited run of fan art poster prints featuring some of the Cycle’s main characters! 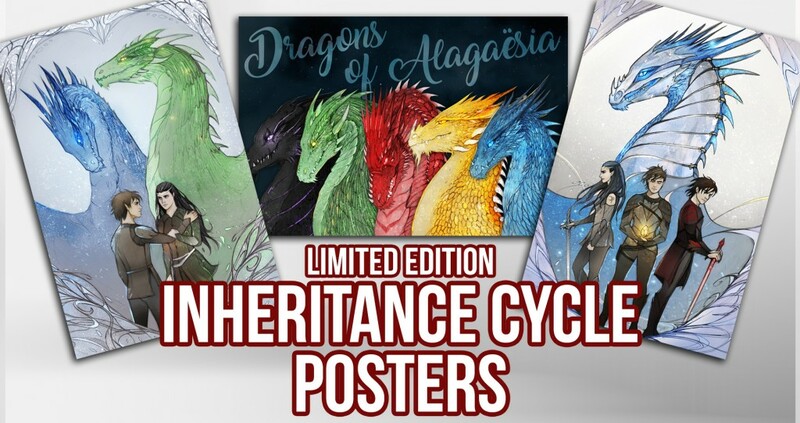 Our first run includes our ‘Five Dragons of Alagaësia’ art and two new pieces: one featuring the Cycle’s four Riders and the other beautifully illustrating our favorite hopefully-will-be-someday couple, Eragon and Arya! Head on over to the Shur’tugal Shop to purchase a poster! The posters, featuring artwork from Polina Andreeva, are printed on high quality matte fine art paper and are coated with a UV-resistant coating to help them hold up over time. Each is 12″x18″ and fit perfectly in frames of the same size! Our stock is extremely low, so the posters won’t be around for long! You can snag each for just $15, or all three for $40! Head on over to the Shur’tugal Shop for more photos and to snag yours now!